She also loves to get her chin scratched, though extremely shy around everyone but me. She is quite a fast walker too, often meeting my slow stroll. She is a beauty as well, having posed for 100's of pictures she helped me build up quite a portfolio. What a great helper. She is my lifetime buddy. Just read your story about Slowby..What a cutie and I love her name. 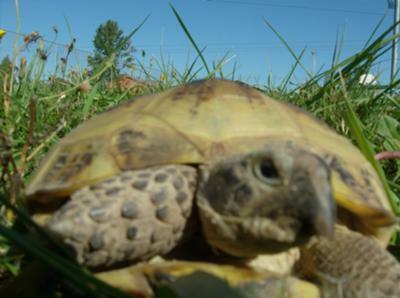 She looks like a Russian Tortoise to me. Am i right. I own 3 Russians and I love them all. I also own Greeks, Africans and a Red Headed Red Footed South American Tortoise. They all are different and yet much the same. I'm glad you have such a wonderful Tortoise to keep company with! I am addicted to the Tortoise World. Your story reminded me of a friend's pet rabbit. Her name is Patrick Roi because the owner was a young hockey fan when he got the rabbit, and Patrick Roi was his favourite goalie. But what I found most interesting about Patrick was the way she responded to Tupperware containers. She would take them in her mouth and flip them distainfully over her shoulder. If you put one back in front of her, she would flip it away again. She had zero tolerance for Tupperware the way your tortoise seems to hate carrots. Thank you for sharing your story. I enjoyed the memories it stirred up.